It as all of the clichés of your high school anime. You have a monotone main character, a tsundere girl, the popular girl, and the non-existence of parents. Also, it as a similar yet fantastic atmosphere to season 1 of My Teen Romantic Comedy SNAFU, another great show. There is a twist to the show though. The main character might talk awkwardly, but he is observant, thoughtful, highly apathetic/pessimistic, yet at the same time wants to make friends. The tsundere girl has an insecurity issue, which she makes up for by isolating herself from everyone else. Unlike a typical tsundere character who is usually just violent or a narcissist. The popular girl is a kind person who gets along with most of the class rather than being unkind to those below her. The lack of parents cliché is explained for once, as they are isolated in a government-run program that makes them live away from family. The unique twists of your slice of life make it enjoyable to watch. TL;DR - Unique twist on high school slice of life shows and fascinating atmosphere. A strong start for these students! Classroom of the Elite is a visual and intellectual treat. I'll be tuning in on a weekly basis to see how the engagement and development between classmates will pan out. In the grand scheme of things, it seems like we're in for some suspenseful plot twists! Definitely give this anime a shot. A strong start for, what could be, summer of 2017's best simulcast! Needs a 2 SEASON ASAP!!! This show is clever, well executed and really captivating. Amazing characters development and a surprising twist. The main character is the complete version of Light Yagami. It's scary. This is the kind of shows that makes you think, and we are asking for more. Finally sat down and watched it. This is awesome. Wait what? Is this the same show I was reading about? At this point, the show could go in any direction but the sheer analytics of the class was highly entertaining. I look forward to seeing how this little gem plays out. This show revolves around a advanced high school and the students are to stay within the school area. In the beginning each student is alloted 100,000 points which equates to 100,000 yen to spend on for the month inside the school. The MC is very analytical and observant; but also monotonous. Judging from the first episode he is going to be the epicenter of how to solve class 1-D's financial problem with the help of Hirikita-san *spoiler*(They were alloted 0points as a class due to showing no merit which case the teacher told them the first day of class resulting to their class being as she said, "Garbage.".). I wish it didn't stop - so good! Easily the best show of the season. Classroom of The Elite will make you think critically about its characters and appreciate the conflict of interests on both a personal level and the big picture. Dynamic story progression and ambitious character development backed by good story writing make this a must watch. If you liked Fruit of Grisaia, I feel like you might like this too. The main characters so far have been fantastic! The dialogue is fantastic; art and animation are very solid. Fan service isn't distasteful for the most part. There might be some that might make the sensitive ones to it uncomfortable, but it didn't bother me and actually contributed to some characters' development later, besides the usual "character development". I'll go into spoiler territory for that later. The only main real problem is that this show introduces far too many characters that don't get fully fleshed out or exist solely as a trope with no deviations. I understand that this is actually beneficial to how the main characters are portrayed and how they stand out from the rest of the cast, but the bar that they set up for the cast is too low in my opinion. The main character seems a bit too overpowered, but it's not bothersome. I've seen far more overpowered MC. The reason why I feel like he's overpowered is that I never felt like he was close to being expelled. There has been the threat of expulsion on him, but I never felt like there wasn't a problem where he couldn't solve it. For the fan service part I mentioned earlier, There have been 4 parts that I can remember as being fan service. Two of them differ from the usual fan service. You'll know which ones they are, because few shows actually pull off similar parts like this show did, Fruit of Grisaia being one. 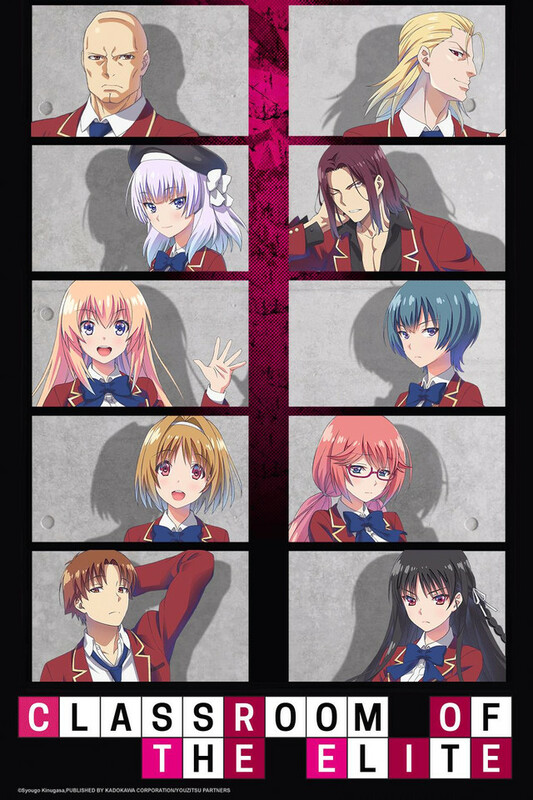 The anime Classroom Of The Elite has a great story line going for it.As it is very similar to the anime Baka to Test to Shoukanjuu. The anime taking place in a school trying to rise up in the ranks of the classes through "tests" and "points" The plot goes through many phases and as well as lots of plot twists throughout the anime.I can say surely that this anime is a incredibly anime and I add my recommendation for anyone who reads this review to watch.